This system is designed to be a supplementary driving aid. It is not intended to replace the driver’s attention, and judgment, or the need to apply the brakes. This system does NOT activate the brakes automatically. Failure to press the brake pedal to activate the brakes may result in a collision. The collision warning system with brake support cannot help prevent all collisions. Do not rely on this system to replace driver judgment and the need to maintain distance and speed. The system does not detect, warn or respond to potential collisions with vehicles to the rear or sides of the vehicle. The collision warning system is active at speeds above approximately 5 mph (8 km/h). This system is designed to alert the driver of certain collision risks. A radar detects if your vehicle is rapidly approaching another vehicle traveling in the same direction as yours. If it is, a red warning light illuminates and an audible warning chime sounds. The brake support system assists the driver in reducing the collision speed by charging the brakes. If the risk of collision further increases after the warning light illuminates, the brake support prepares the brake system for rapid braking. This may be apparent to the driver. The system does not automatically activate the brakes but, if the brake pedal is pressed, full force braking is applied even if the brake pedal is lightly pressed. The collision warning system’s brake support can only help reduce the speed at which a collision occurs if the driver applies the vehicle’s brakes. The brake pedal must be pressed just like any typical braking situation. The warning system and chime can be turned on and off separately; the warning system sensitivity can be adjusted to one of three possible settings by using the information display control. Refer to the Information Displays chapter. Note: If the system cannot be turned off in a vehicle equipped with MyKey®, refer to the MyKey® chapter. Note: If collision warnings are perceived as being too frequent or disturbing then the warning sensitivity can be reduced, though the manufacturer recommends using the highest sensitivity setting where possible. Setting lower sensitivity would lead to fewer and later system warnings. Refer to the Information Displays chapter for instructions on reducing the sensitivity. If a message regarding a blocked sensor appears in the information display, the radar signals from the sensor have been obstructed. The sensors are located behind a fascia cover near the driver side of the lower grille. When the sensors are obstructed, a vehicle ahead cannot be detected and the collision warning system does not function. The following table lists possible causes and actions for this message being displayed. Due to the nature of radar technology, there may be certain instances where vehicles do not provide a collision warning. These include: • Stationary vehicles or vehicles moving below 6 mph (10 km/h). • Pedestrians or objects in the roadway. • Severe weather conditions (see blocked sensor section). • Debris build-up on the grille near the headlamps (see blocked sensor section). • Small distance to vehicle ahead. • Steering wheel and pedal movements are large (very active driving style). • High interior temperatures, which may deactivate the illumination or the warning lamps until the interior temperature reduces (audible warning still sounds). Certain conditions may reduce the visibility of the warning lamp; therefore, it is recommended to keep the audible warning on. 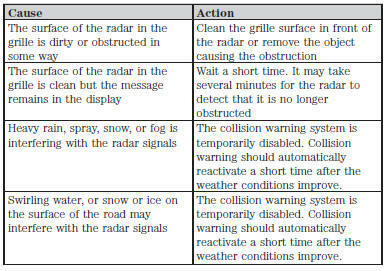 If the front end of the vehicle is hit or damaged, the radar sensing zone may be altered causing missed or false collision warnings. See your authorized dealer to have your collision warning radar checked for proper coverage and operation.